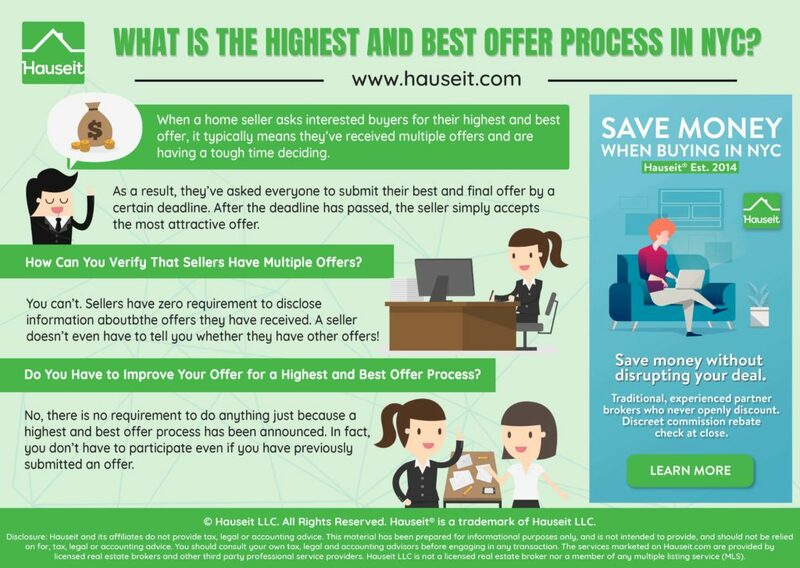 When a home sellers asks interested buyers for their highest and best offer, it typically means they’ve received multiple offers and are having a tough time deciding. As a result, they’ve asked everyone to submit their best and final offer by a certain deadline. After the deadline has passed, the seller can choose the most attractive offer that has been submitted to accept. How Can You Verify That Sellers Have Multiple Offers? Do You Have to Improve Your Offer for a Highest and Best Offer Process? You can’t. Sellers have zero requirement to disclose information about the offers they have received, nor even whether they have an offer. While it’s quite standard for listing agents and sellers to disclose whether they have received offers, and whether there is an accepted offer, there is no requirement for them to do so. Practically speaking, there is no way for anyone to enforce them to reveal any of this, or the truthful version at least. As a result, savvy listing agents have asked for a highest and best offer process when there is only one offer, or sometimes when there isn’t even a single offer but only interested buyers. Because buyers have no way to verify any of the information about the competitive situation, buyers can very easily bid against themselves in a highest and best offer auction. The best thing you can do is to gauge how popular the listing is through neutral, third party metrics such as the number of saves the listing has on various, popular real estate search websites. Another good metric is how many people did you see show up at the open house. Was it packed or was it eerily quiet? And don’t trust the sign in sheet either, sometimes listing agents will fill in the first few slots with fake names to give the appearance of demand. Pro Tip: Watch out for unethical listing agents who try to convince you that there really is another offer by showing you an email from their phone. This trick can easily be accomplished by creating a fake email address. Unfortunately, this trick has been known to work on quite a few emotional, first time home buyers about to over pay for a property. No, there is no requirement to do anything just because a highest and best offer process has been announced. In fact, you don’t even have to participate even if you have previously submitted an offer. Just remember, offers don’t mean anything in NYC until contracts have been signed! If you want to participate but you don’t want to improve your bid, then it’s best to notify the listing agent that you are repeating your previous offer. You could also just not respond or do anything, but you might miss out on the deal if the listing agent assumes that you’re no longer interested because you didn’t formally repeat your offer. Ultimately, whether you improve your offer or not depends on how much you want the property, how much information you can get out of the listing agent, how credible you think the listing agent’s story is regarding multiple offers, how much you think the property is actually worth, the current condition of the market and interest rates, and whether you have multiple other offers that are or might be accepted. Pro Tip: Get insight into the highest and best offer process by thinking like your opposite counterpart, the seller. 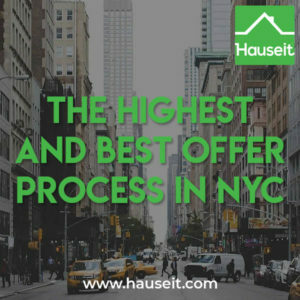 Read our guide on dealing with multiple offers on a house as the seller in NYC to get a fresh perspective. If you have an experienced buyer’s agent, have him or her give the listing agent to fish for color. A seasoned buyer’s agent may be able to tell whether the listing agent is telling the truth or not, or whether the listing agent’s story appears shaky. When you’re ready to submit your offer, make sure to do so shortly before the deadline so the listing agent doesn’t have an opportunity to shop your offers with other bidders. However, this strategy can backfire if you or your buyer’s agent forgets and misses the deadline. As a result, it’s best to send the offer using a delayed send feature so the listing agent receives it 30 minutes before the deadline. Remember to activate this delayed email at the server level so that it will send even if your computer is closed. Another strategy is to submit an offer with an odd vs round number at the end. For example, it just might make a difference if your offer is $1,245,621 vs someone else’s offer who is $1,240,000 or even $1,245,000! We’ve seen this strategy work before, so it certainly doesn’t hurt to offer a few odd dollars more. Pro Tip: A rather devious strategy that may backfire is not improving your offer, or only improving your offer marginally and waiting to hear the outcome. As soon as you find out that you’re not the winning bidder, you immediately re-submit a higher offer. Some sellers may accept your higher offer since nothing is final until contracts are signed anyway. However, this strategy has been known to backfire as some sellers really want to play by the rules and will stick with the original highest and best offer process winner even if your new offer is higher. 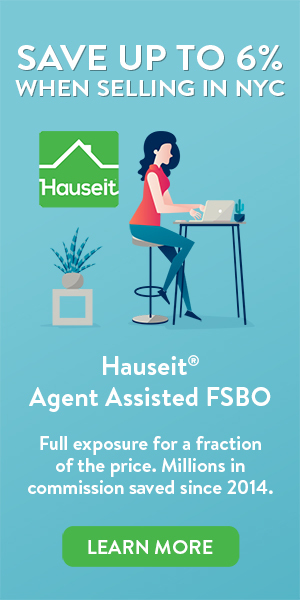 We’ve included a couple of highest and best offer process notification emails that have been sent by sellers and listing agents for you to reference. The second email is actually a reminder for the upcoming highest and best offer deadline. Thank you for both your patience and interest in our apartment for sale. We sincerely appreciate your interest and your offers. Due to the level of interest and the offers we’ve received from multiple bidders, we’d like to invite everyone to submit their highest and best offers by 6pm this Friday. Please allow us up to 48 hours after the deadline to fully evaluate all offers before we announce the results. Please also note that offers are already above listing price. To keep the process fair, we will not be providing any information on the competitive situation prior to the conclusion of the best and final process. We will be honoring the results and will not accept any revised bids after the deadline, so please put your best foot forward! As a reminder, the best and final offer deadline is today at 6pm. Please remember to include with your offer a completed REBNY Financial Statement as well as supporting documentation to substantiate your offer or your client’s offer (i.e. mortgage loan pre-approval letter, bank statement, etc.). Please feel free to reach out with any questions. Pro Tip: Offer emails for buyers wishing to participate in a highest and best offer process are no different than offer emails in a normal bidding situation. You may want to re-submit your entire offer even if the listing agent already has your offer documentation from a previously submitted offer.